The human eye lens consists of a highly concentrated mix of several proteins. Protective proteins prevent these proteins from aggregating and clumping. If this protective function fails, the lens blurs and the patient develops cataracts. Two research groups at the Department of Chemistry of the Technische Universitaet Muenchen (TUM, Germany) have succeeded in explaining the molecular architecture of this kind of protective protein. Their findings, which are published online in the current early edition of PNAS (Proceedings of the National Academy of Sciences), shed new light on the work of these proteins and may be able to help in the development of new treatments. Cells have a variety of protein complexes that manage vital tasks. The functions of these "molecular machines" depend largely on their three-dimensional structure. In the first instance, proteins are long chains of amino acids, like a long piece of woolen thread. So-called chaperones help them to fold in the desired three-dimensional form after their production. If this folding process fails, the protein thread becomes an inextricable, useless tangle. Small heat shock proteins (sHsps) are a particularly important group of chaperones. They prevent the clumping of proteins under stress conditions. αB-crystallin and the related sHsp αA-crystallin are the main representatives of the sHsps found in humans. Whereas αA-crystallin mainly occurs in the eye lens, αB-crystallin is also very common in the brain and in the heart and muscle tissue. In the eye lens, they counteract diseases like cataracts. Malfunctions of the αB-crystallin in tissue cells can give rise to cancer and neurological defects, including Alzheimer's disease. Many research groups have focused their work on the α-crystallins due to their medical relevance. Despite intensive efforts, up to now, none of them have managed to determine the molecular architecture of these proteins. However, TUM biochemists have now succeeded in producing αA-crystallins and αB-crystallins recombinantly in bacteria and in obtaining uniform, clearly-structured complexes. A detailed structural analysis of these proteins was carried out in cooperation with the Chemistry Department's Center of Electron Microscopy. 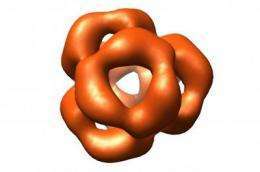 The research groups were able to show for the first time here that, contrary to previous suppositions, αB-crystallin forms a defined globular structure comprising 24 subunits, which are reminiscent of a perforated soccer ball. Thanks to the identification of the three-dimensional structure of αB-crystallin, which is currently being further refined, the basis has now been established for comparing healthy and disease-promoting mutants and, based on this, for clarifying the way they function. The scientists hope that this will lead to the discovery of new treatments.